We all know just how much of a turning point in metal the ‘80s were. There were many pioneering acts pushing the boundaries of musical extremity from that era, but possibly none more so than Birmingham (U.K.) duo Godflesh. They were taking a path different from the thrash, grindcore, and death metal acts of the era with their unique and genre defining industrial metal attack of guitars, vocals, bass, and a drum machine. It was simple, lo-fi, groundbreaking and very influential. With a string of albums and EPs, that began with their underrated self titled debut EP and continued with their amazing debut long player, Streetcleaner, Godflesh would continue to pave the way for industrial metal until their official disbandment in April 2002. Front man Justin Broadrick’s untimely disbandment of the pioneering act left a legacy of unparalleled recordings. It is a unique mix of industrial metal and dub through various studio releases and subsequent remixes over six full length albums, eight EPs and one two-disc best of collection. But in November 2009, some seven and a half years since Broadrick’s put a nail in the coffin of Godflesh, it was announced that they would do a one off appearance at the 2010 Hellfest in Clisson, France. It was to be nothing more than a one off but as interest in the revolutionary act continued to build surrounding this, soon enough, Broadrick confessed that the group were working on the band’s first new material in almost a decade. It would be a further three and a bit years from the time that hint was dropped until their first new material would see the light of day since reforming. Titled Decline and Fall, quite simply, if this four track EP is a taste of things to come, then the future is looking very bright once again for this reactivated duo. Once the lead “single” - for want of a better word - titled “Ringer”, kicks off after 17 seconds of noise, there is no denying that Godflesh are back, better than ever. Perhaps it’s the shows that the band have played Streetcleaner in full, or perhaps it is just the fact they are reunited doing what Broadrick does best. Either way, the end result is something straight out of the era between Streetcleaner (1989) and Selfless (1994) and it is nothing short of absolute aural bliss. It’s almost hard to believe then that “Dogbite” actually ups that ante but it does. With a swing akin to “Spite” (the opening track from 1992’s Pure), “Dogbite” is a nose hair clear as the album’s best track. Sure there may only be four to pick from but when then calibre is this high, it makes picking best on ground pretty bloody hard. As the EP continues, the ringing drone of the verse to “Playing With Fire” and jagged chorus is very reminiscent of the vibe of “Pure” and along with the seething, sludgy riffs of the title track “Decline and Fall”, the EP manages to shift closer to Pure territory. That’s by no means a bad thing as most would agree that right up to and including 1994’s Selfless are the band’s best work by far. 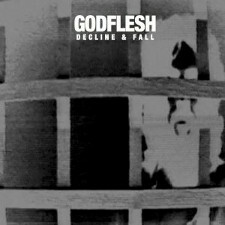 If Decline and Fall is anything to go by, then the forthcoming Godflesh long player has a lot to live up to. Sure some will argue the pros and cons of anything Godflesh put their name to after 1995, but the band’s first output in over a decade is clearly rooted in their earlier years. I think Broadrick and Co. knew this as this excellent return is clearly rooted in the band’s era up to Selfless. I’d be surprised if this isn’t a hit with long time fans as everything is there just as you’d expect. It might only be an EP but this is one of the best releases of 2014 for sure.